When Lucie is reluctantly befriended by her neighbor in Love Water Memory, the reclusive woman determines to teach the absent-minded girl how to cook. First Susan shows her how to make the perfect omelet, then promises that a lesson in pie making would be in their future. As a former resident of the Puget Sound area, I was looking forward to learning pie making methods from the Pacific Northwest native. I have fond memories from the years I lived there with my Navy enlisted husband of stopping at Kitsap Peninsula roadside fruit stands to buy fresh Washington cherries by the gallon. When the story veered in a more urgent direction so that the reader could learn how Lucie and Grady’s story concluded, I decided to fill in for Susan and make my January book review post all about pie making. I hope that fictitious Susan would approve of my methods. Pie making is pretty simple. Ever hear the phrase easy as pie? It exists for a reason. 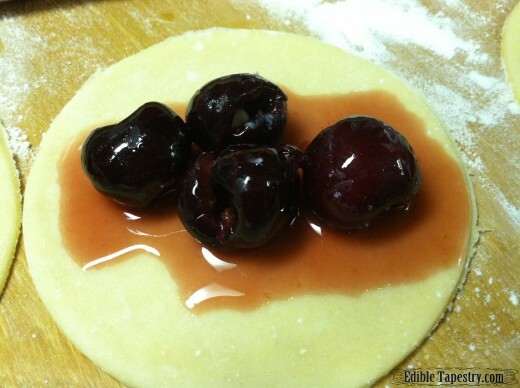 As long as you begin with a tried and true recipe, such as the one I spent those years and bags of Washington cherries working hard to develop, Ultimate Flaky Pie Crust, you should end up with a light and tender homemade crust to enfold any filling you choose. The most fun for me is in the decorative portion of pie making. A basket weave lattice is my favorite, but vent-slit, sugared tops and plain fluted edges are just as pretty. For more ideas on making decorative pies, check out Rachel Sanders’ BuzzFeed article 23 Ways to Make Your Pies More Beautiful. Filling recipes are easy to come by. Poured fillings for pumpkin, custard, or cream pies have no pastry topping. Pie pastry itself is primarily made from flour, fat — butter, lard, or oil–, and water. The addition of eggs and acid can make it more tender but are not necessary elements. The key to a flaky crust is to avoid overworking the dough. Gluten in wheat flour is activated when dough is manipulated. That is why bread dough is kneaded to make it elastic, but pie pastry dough is only mixed until combined. To make a light crust you do not want to work the gluten until it gets rubbery. 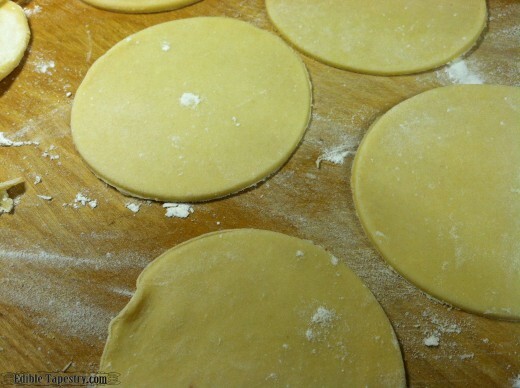 Chilling the dough before rolling, or simply allowing it to rest at room temperature, allows gluten to settle down before the pastry is shaped. A refrigerator pie, such as chocolate cream, is poured into a baked pie shell. To keep the shell from rising and bubbling up while it bakes, a layer of aluminum foil can be placed over the rolled crust in the bottom of a pie pan and covered with raw beans. The weight of the beans will hold the shell in place as it cooks. Extra water for sealing the edges of the turnover dough. 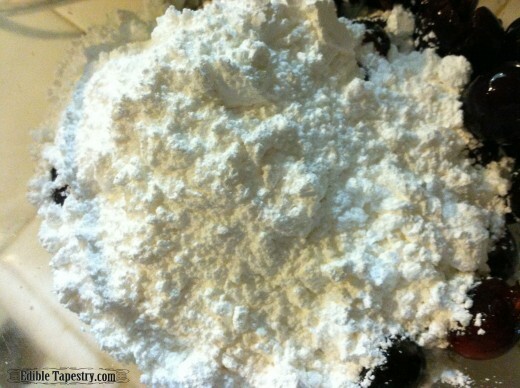 To make the pastry, sift together the flour, baking powder, and salt. 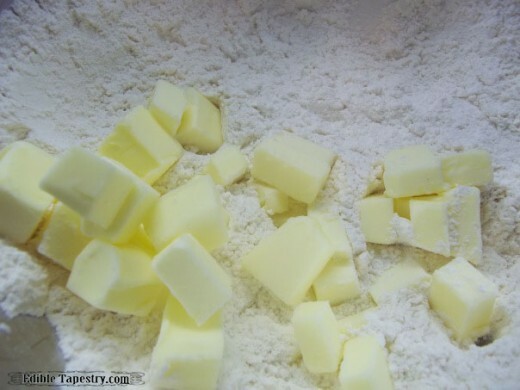 Cut in the butter until the mixture is crumbly. You can use a pastry cutter, your fingers, or even a couple of forks. And once you have the method down, you can take a shortcut and use a food processor. Stir in the vinegar and egg, then drizzle in a little water at a time while mixing, just until the dough holds together. Chill until ready to use, half an hour or so, to allow the gluten to rest for easy rolling and the butter to firm up to prevent sticking. Make your filling by combining all the ingredients. 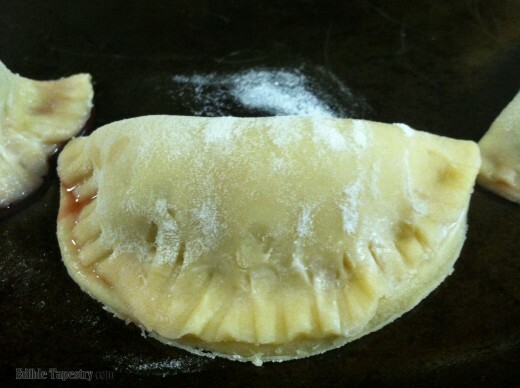 Roll the pastry dough onto a generously floured surface to around an 1/8″ in thickness. Cut out circles any size you like. I used a plastic food storage container approximately 3″ in diameter. 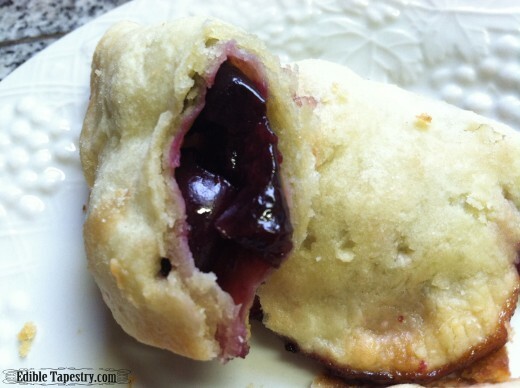 Place a heaping tablespoon of the cherry filling onto the center of each dough round. Lightly brush the edge of half the circle of filled dough with water. You can use a pastry brush or just your fingertip. 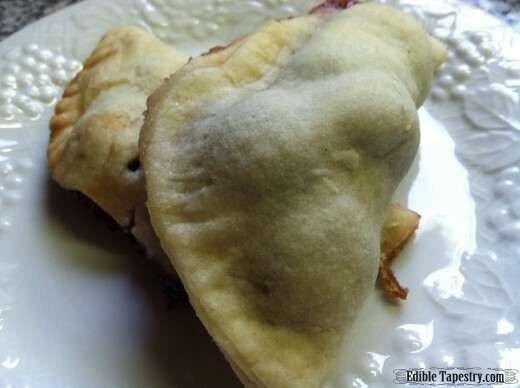 Fold the opposite edge of dough over the filling to meet the moistened edge. With dry hands, pinch the edges together to seal. 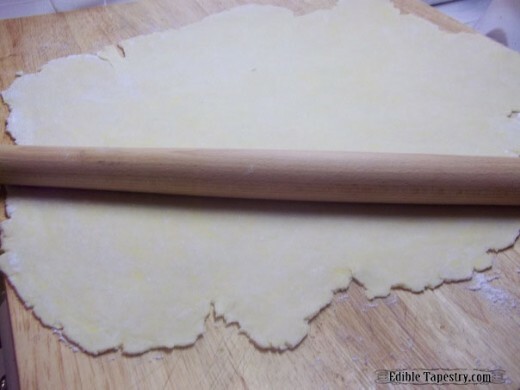 Use fork tines to make a decorative edge over the pinched dough, if you like. 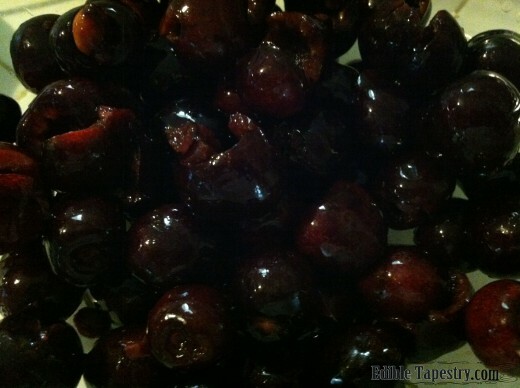 Note: Any flavor of commercially prepared pie filling can be substituted for the cherry filling. To make the pastry with a food processor, whir together the dry ingredients. Add the butter and cut in by pulsing the processor until it is all combined. Blend in the egg and vinegar. Drizzle in the water slowly while the machine is running. Turn it off the second the dough comes together and leaves the sides of the bowl, forming a ball. 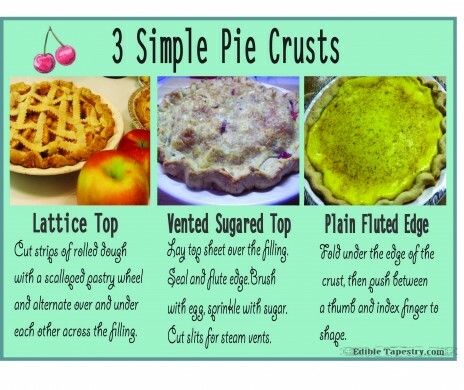 Such good pie crust advice! Thanks so much! Thank you so much . I too wanted Susan to describe her pie crust techniques to Lucie. Loved the Omelet tips. Truly loved the entire book. My heart hurt for Lucie, but I cried for Helen. Her loneliness was terrifying, then her shame and frustration for not recognizing Lucie’s illness brought me to tears. Excellent read. I agree, Daniela, but my heart really ached for Grady as I read. Susan scared me a little. I never would have gone into that woman’s house. I’m so glad Lucie was courageous enough to make a friend that day. She certainly needed one!